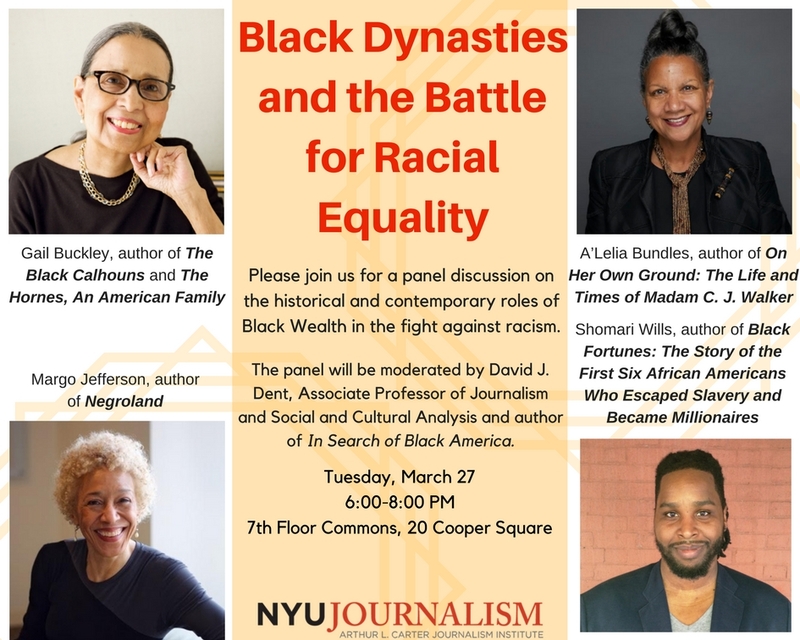 Please join us for a panel discussion on the historical and contemporary roles of Black Wealth in the fight against racism. Gail Buckley, author of The Black Calhouns and The Hornes, An American Family. A’Lelia Bundles, author of On Her Own Ground: The Life and Times of Madam C. J. Walker. Margo Jefferson, author of Negroland. Shomari Wills, author of Black Fortunes: The Story of the First Six African Americans Who Escaped Slavery and Became Millionaires. The panel will be moderated by David J. Dent, Associate Professor of Journalism and Social and Cultural Analysis and author of In Search of Black America.